I found a solution! See bottom of this post. 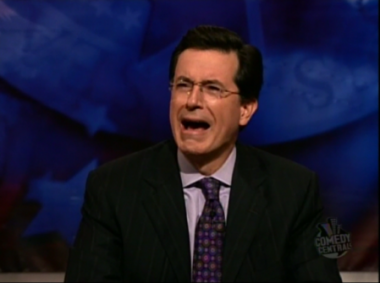 Comedy Central’s Motherload is like the “interweb mecca” for The Daily Show and The Colbert Report fans. It offers a fairly large archive of clips for both shows, streamed for free 24 hours a day, 7 days a week. Whenever you wanted a Jon Stewart or Stephen Colbert (or *insert your favourite correspondent’s name here*) fix, you knew where to go. Because we all know with the recent Viacom (Comedy Central’s parent company) versus YouTube lawsuit, it’s pretty much the only source for video clips for these shows. Unfortunately, and quite sadly so, us TDS fans up north are being left out. We’re just on the outside, looking in, whimpering and greatly irritated by the fact that when we now click to either ComedyCentral.com or TheDailyShow.com, we are greeted by this lovely page seen on your right… before being redirected to thecomedynetwork.ca. Thanks a lot CTVglobemedia.